By Ashutosh KS in Internet. Updated on July 19, 2016 . Google is much more than just a search giant. It is also home to many of your favorite products: Gmail, YouTube, and Chrome, just to name a few. Apart from that, it also offers many products to help you keep track of your data. Most of these are hidden deep inside the My Account dashboard, which many users don’t really know of. These hidden tools may reveal interesting details about your usage of Google’s many services. We’ve compiled a list of important Google URLs of some hidden tools that carry information of what you did with Google, mostly from the searches that you have made on their many products, the voice searches and typed out Google searches that you have made. Are you ready to find out what how Google knows about you? It summarizes data for each product you use and allows setting preferences for personal account products. 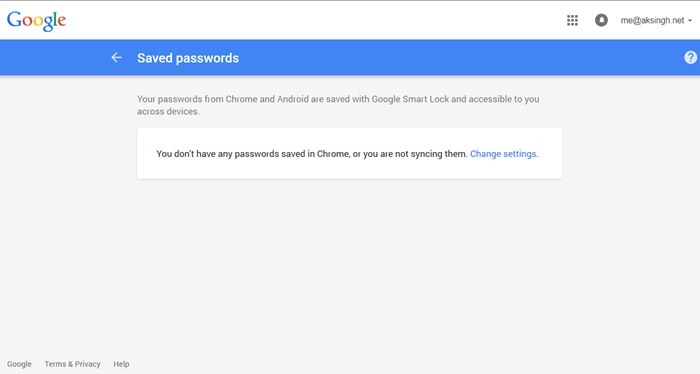 Saved Passwords is the tool to view the usernames and passwords (stored with Google Smart Lock) that you have ever typed and saved in Google Chrome and Android for signing into various websites. These stockpiled credentials are synced and accessible across your numerous devices. 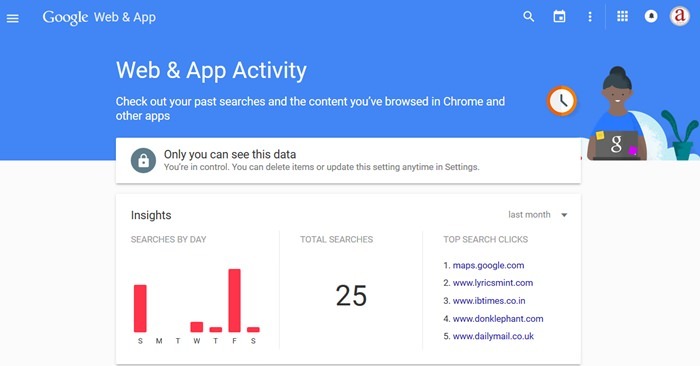 Along with showing the list of past search terms you have made on Google Search, Web & App Activity also carries information about the content you browsed on Chrome and other apps. You’re the commander of what data gets stored and can delete your past searches and browsing history. You can also turn it off completely, disabling the storing of your searches and web history. 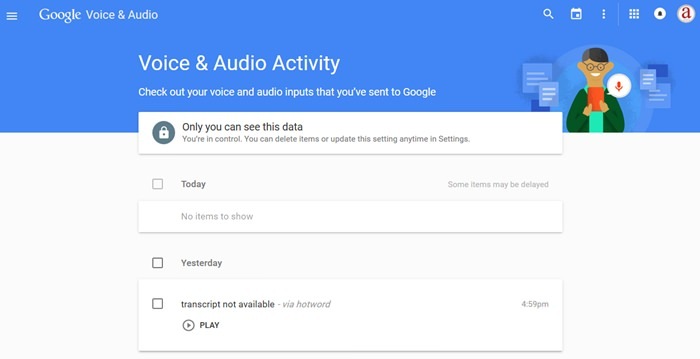 Voice & Audio Activity lists the voice and audio inputs that you’ve sent to Google during your searches. These can be the audio searches you’ve ever spoken into the search boxes of Google Search or the voice commands and search queries you’ve given to Google Now. You’re in total control of this data and can delete the items or update the settings anytime as you require from this link. 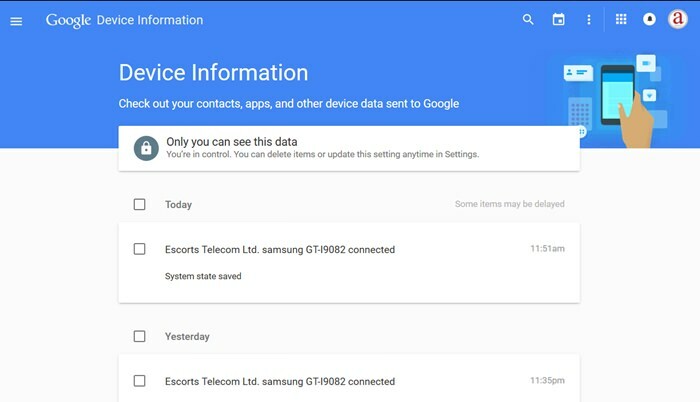 Device Information allows you to check out any data sent from your devices to Google. It displays all the information such as contacts, apps and app data, system state, audio commands or search queries and other device data that your devices upload to Google servers. It’s helpful to identify what information about you get transferred by your devices. YouTube Watch History lists all the videos that you’ve ever seen on YouTube while being logged into your Google account. YouTube Search History lists all the search items you ever typed in YouTube. These searches stored by Google are then used to show you relevant ads and better video suggestions. You can delete the history item-by-item or the entire history at once and can even pause the history. 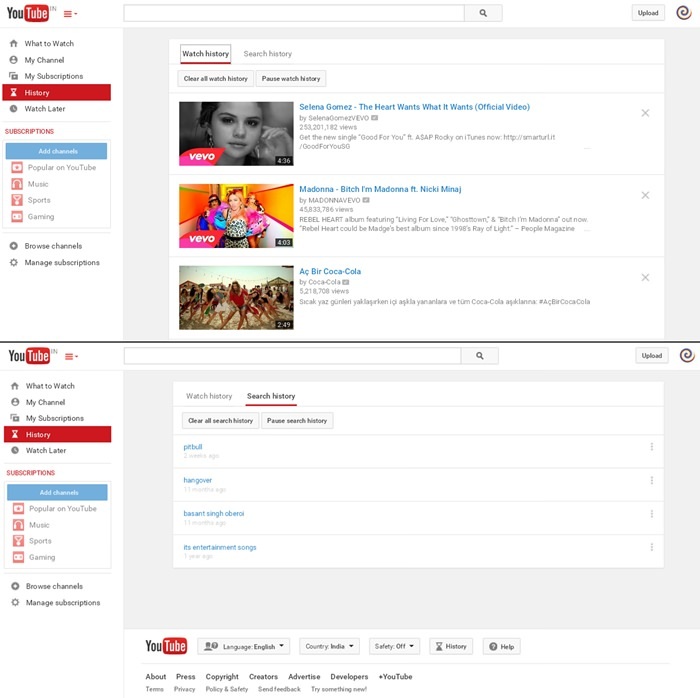 (Find more Youtube tricks here). Location History shows all the places that your Android device may have reported (as your recent location) back to Google servers. It is used by Google products like Search, Now and Ads to show you useful information based on where you’ve been or where you are. You can switch this feature on or off, check all your locations, and delete certain locations or the entire history from this interface. 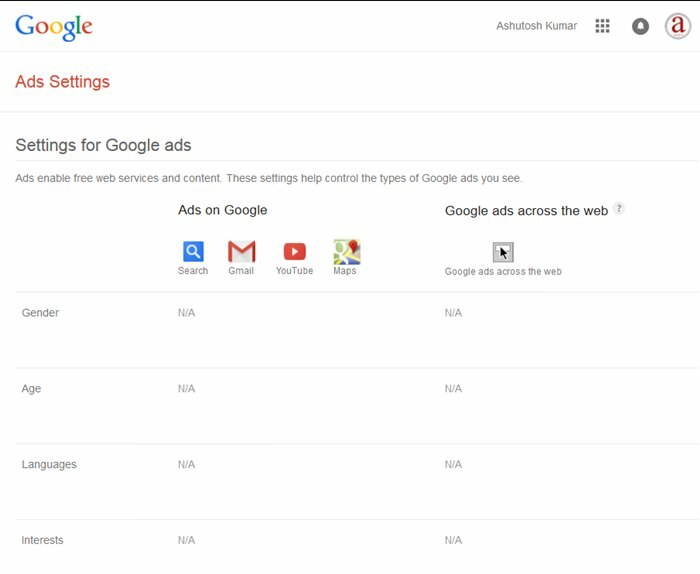 Ads Settings displays your ad profile as created by Google based on what it knows about you from your Google+ profile, web & app activity, ads you’ve clicked, etc. Google uses it to show you the most relevant advertisements that you‘re more likely to click or follow. You can opt-out of interest-based ads on Google, YouTube and Google ads across the web from this page. Apps Permissions shows a compilation of all the things having part or full access to your Google account. 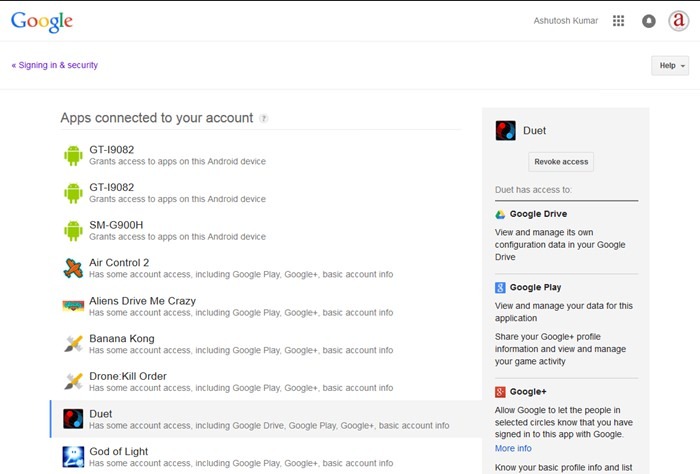 It shows a list of connected and permitted Android devices, mobile apps and games, web apps and websites, browser extensions and Google Scripts. You can revoke access to any of the listed item if you no longer want that item to access your account. 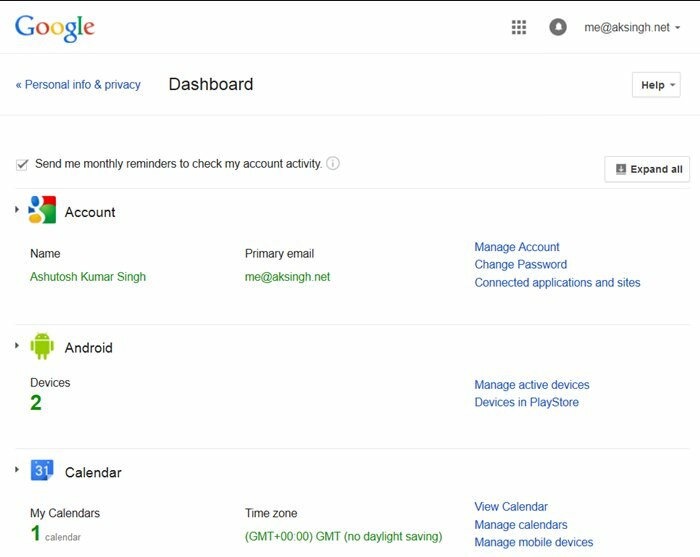 Account Activity shows you a stack of all sign-in activities pertaining to your Google account. It lets you view all the devices that have been active in the last 28 days or are currently logged in to your account. You can remove account access for Android devices but unfortunately, you can’t revoke access for browser sessions. 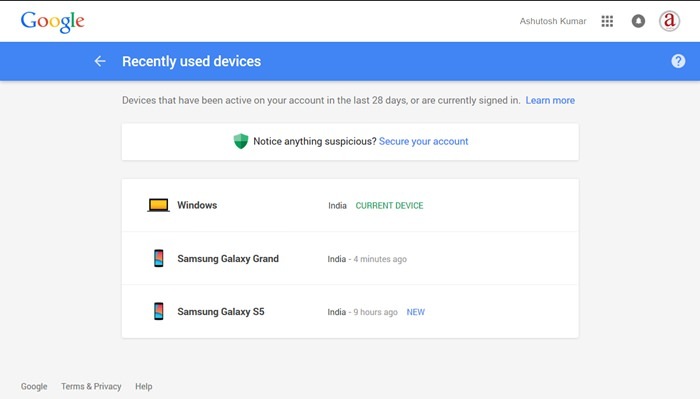 If you notice anything suspicious, you can always secure your Google account. Here are two more tools you might want to use: one lets you download all your data sets as archived by Google and the other lets you decide what happens to your inactive google account. Data Tools lets you take out all of your collected and stored data out of Google. 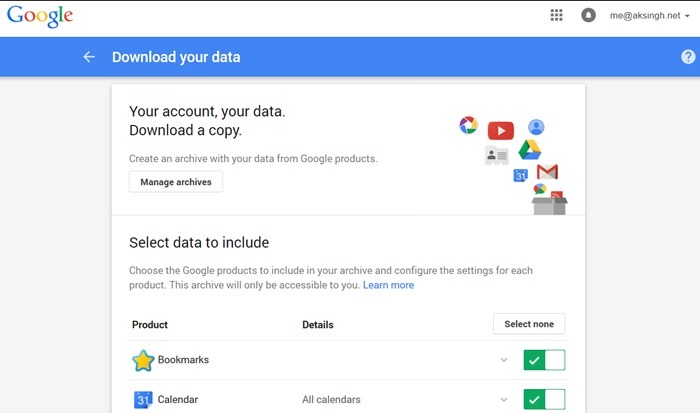 It creates a single downloadable archive of your data from various Google products you use – such as Google Photos, Contacts, Gmail messages, Google Drive files, YouTube videos and subscriptions, Keep notes, etc. You choose to download it all or only download the data set you require. 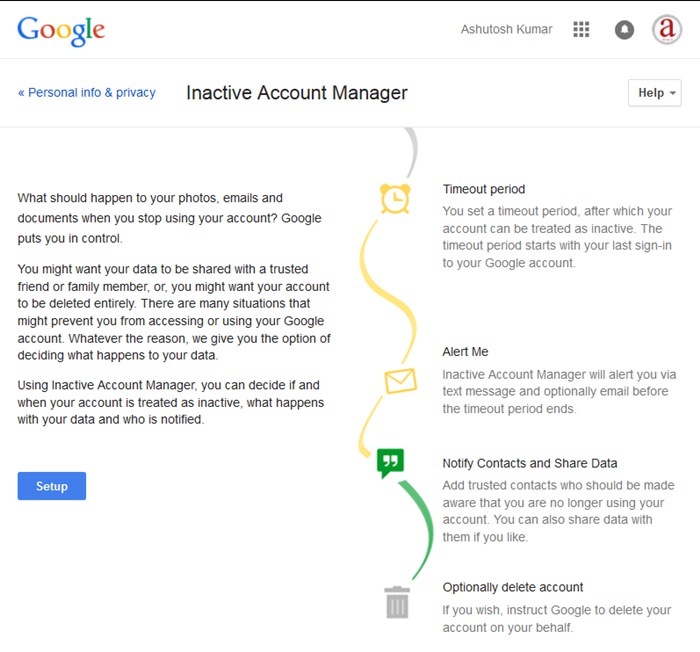 Inactive Account Manager lets you govern what happens to your Google account if it has been inactive for long time. You need to login into your Gmail account once every nine months as per its program policies, otherwise Google may terminate your account. You can use this page to protect your account against termination due to inactivity. You can set timeout periods and notification alerts to your phone or email, allow the sharing of data with trusted persons, or delete your account entirely after the timeout.